When we look at Late Antique Syro-Palestine and Arabia in the early seventh century, the time when Islam is said to have become a religion, an interesting yet complex mosaic of cultures and languages can be observed. Linguistically, various languages were spoken and written. Here we confront a common long-persisting misconception, namely that the Arabs were largely illiterate before Islam. Nothing could be farther from the truth. Roughly speaking, Arabia in Antiquity was divided into three geographical regions: Arabia Felix, Deserta and Petraea. 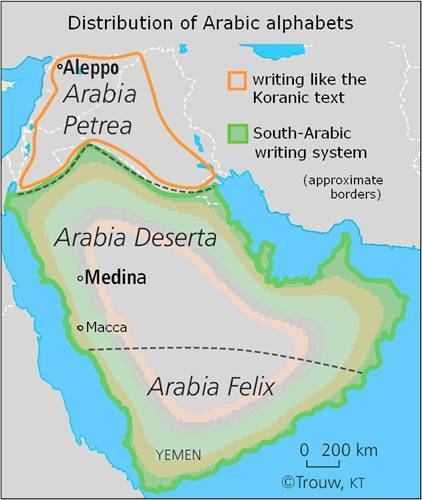 In the South-western corner (approximately modern Yemen), Arabia Felix, or “Happy Arabia”, various South Arabian Semitic languages were spoken, the most important of which is Sabaean, written in a Semitic script which split off from the Syro-Palestinian alphabetic tradition during the Bronze Age. Ancient Yemen was heavily involved in the spice and incense (later also the silk) trade from which it garnered considerable wealth. To the North, in what is now more or less Saudi Arabia, was the Classical Arabia Deserta, or “Abandoned Arabia”, home to Mecca and Medina, a region sparsely inhabited by nomadic tribes and various oasis settlements, often caravanserais for the long-distance trade. The contemporary local languages are nowadays designated as Ancient North Arabian: they are interrelated Semitic (oasis) dialects that, however, are not direct ancestors of Classical Arabic. Inscriptions in these languages or dialects are attested roughly from the sixth century BC to the sixth century AD throughout the region into the modern Hashemite Kingdom of Jordan. The writing culture of Arabia Deserta was borrowed from the South —i.e., they used variants of the Ancient (epigraphic) South Arabian script. Further to the North, in the geographical area of Syro-Palestine (which includes the Egyptian Sinai, Israel, Jordan, Lebanon, Syria and South-eastern Turkey and North-western Iraq) was Arabia Petraea, or the Provincia Arabia, the Roman border province whose capital was Petra. This region had been exposed to Greco-Roman culture for close to a millennium. The major written languages here were Greek and various Aramaic dialects, the most important of which was Syriac. Furthermore, much of the population of this region (unlike in Arabia Deserta) had converted to one form or another of Christianity (which was anything but an homogenous, monolithic entity). The important point that must be noted is that although in Arabia Petraea Aramaic and Greek texts are often attributed to the Nabateans, Palmyrinians and others who were actually neither Aramaean nor Greek, their names and occasional stray words in inscriptions show that they were ethnically Arab. We are dealing with a situation similar to that of medieval Western Europe in which Latin was the written language, while the spoken languages (vernaculars) were the precursors of the languages spoken today. Briefly summarized, the Arabic language (especially with regard to the primary diagnostic feature, the definite article al-) and script of Arabia Petraea are the precursors of the classical Arabic script and language. Before Islam, texts in the Aramaic script are hardly attested south of the modern state of Jordan and then only in the extreme North-west corner of modern Saudi Arabia. In Arabia Felix and Deserta other scripts and languages were current. It is in Arabia Petraea that we find occasional Arabic texts in an Aramaic script and even Arabic written in Greek characters. A sixth/seventh century fragment of Psalm 78 found in the Umayyad “Mosque” at Damascus shows just how close this Arabic is to what would later morph into Classical Arabic (e.g., imala). The precursor to Classical Arabic was thus spoken in Syria, not in the Hijaz. We now have two independent sources of prima facie contemporary evidence —aerial linguistics and script distribution— to show that the language of the Koran must be based on a Syro-Palestinian Arabo-Semitic dialect and that the script employed was not that used in Mecca and Medina of the period, but the one used in Arabia Petraea. If the Koran is actually a product of the Hijaz, then we would expect it to be in a different (Ancient North Arabian) Semitic language and written in a different script. That is not the case. The traditional account of the Koran’s origins is not supported by the evidence. The peculiar thing about the Arabic script we are familiar with today is its polyvalence —i.e., it needs diacritical dots (i`jam) to distinguish between otherwise identical consonantal characters (rasm). For example, the Arabic glyph ں can be read as b (ب), t (ت), th (ث), n (ث) and medially as y (ی). Thus the Arabic script distinguishes eighteen glyphs that are made distinct by diacritics to render twenty-eight phonemes. A part this polyvalence is not phonetically conditioned; it is due to the cursive erosion of distinct forms (e.g., b, n, medial y). 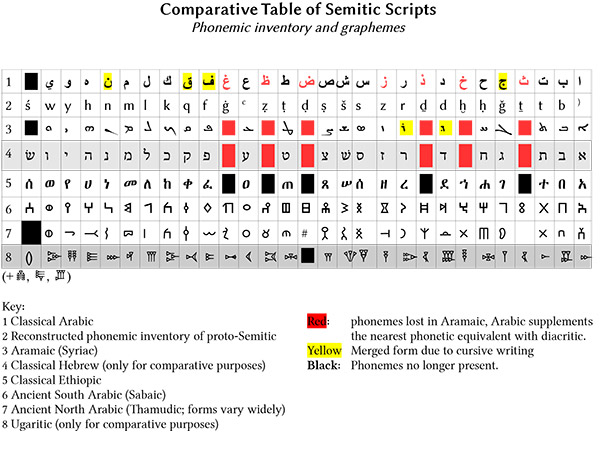 In other cases, it is due to the fact that a twenty-two letter Aramaic alphabet was later supplemented to render additional Arabic phonemes (i.e., sounds that Aramaic had lost, but which survived in Arabic) by adding a diacritical dot to the nearest phonetic approximant. This, along with borrowed Aramaic orthographic customs (such as the tā° marbūṭah to mark the feminine ending, the alif otiosum, etc.) shows unmistakably that Arabic writing evolved from a long tradition of writing Aramaic and can, therefore, only have occurred in a region where the Arabs had had a long exposure to Aramaic writing culture. The only place where this could have happened is Arabia Petraea. If the Koran were actually a product of Mecca and Medina, then (besides it being written in a different Semitic language) it would have had been composed in the South Arabian script which unambiguously differentiates each of the twenty-eight phonemes of Arabic and which, by this time, had a twelve hundred year tradition in the Hijaz. That this ideally suited script was not used means that it was unknown to the writers of the Koran. The fact that both the script and language of the Koran point to the Classical Arabia Petraea of Syro-Palestine, and not Arabia Deserta, is further supported by the fact that the Koran’s vocabulary is largely borrowed from Aramaic, especially Syriac, the liturgical language of the local churches. Needless to say, the semantics of the technical religious vocabulary of the Koran, the spelling of the names of biblical figures, and the often subtle biblical allusions presuppose an intimate knowledge of biblical literature in its Syro-Aramiac tradition. Syro-Palestine was heavily Christianized by the seventh century. Although there is some evidence of Christianity and Judaism in “happy” and “deserted” Arabia during this period, it just does not appear to have the critical mass necessary to launch a new religion. Furthermore, the theological, doctrinal controversies that gave rise to the “heresies” that permeated Late Antique society were largely absent outside of the Roman Empire. Thus, all of the contemporary epigraphical, literary and linguistic evidence points to Islam being a product of Arabs living in Syro-Palestine. This claim stands in stark contrast to the traditional narrative of a blitzkrieg from the Hijaz into Syro-Palestine. This event has vexed modern archaeologists. There is simply no archaeological support for a quick, violent and destructive invasion of Syro-Palestine as reported by traditional Islamic sources. Instead, excavations reveal a continuity of occupation and culture: the period in question is, archaeologically speaking, quite uneventful and conservative. The major cultural changes in ceramics and the like (such as the introduction of glazed wares) only occur in the eighth century. There is an uninterrupted settlement continuum through the Umayyad period (in which the mosaic as an art-form reached its peak) into Abbasid times. Even then the change is gradual rather than sudden. Where there was change, it consisted of a tendency towards smaller settlements in the countryside, which became favored over towns. Archaeologically speaking, then, an Arab or Muslim conquest of Syro-Palestine is invisible. And the reason for this was that the Arabs were already living in the region as evidenced by their language. In the end, archaeology, epigraphy and linguistics mitigate against a Hijazi origin of the Koran. The latter can only be a product of Hellenistic Syro-Palestine. Robert M. Kerr read Classics and Semitics at Tübingen and Leiden Universities. At the latter, he received his doctorate on the survival of Punic in Roman North Africa. He currently teaches Hebrew at the University of Waterloo.